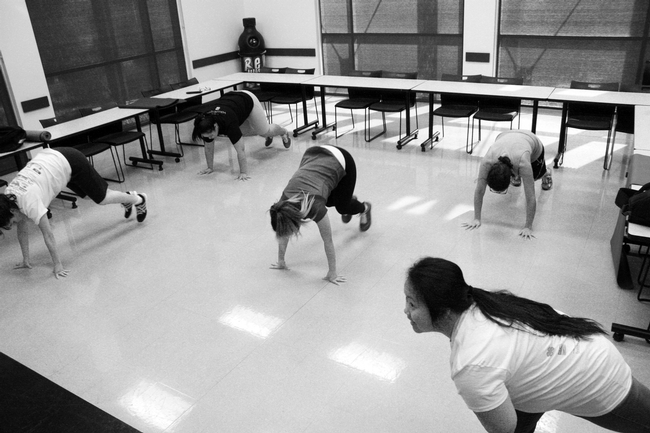 San Joaquin County nutrition educators exercise together after work. San Joaquin County nutrition educators are not only promoting physical activity to the families they teach, but walking the talk together every day. Family nutrition educators from University of California CalFresh [UC CalFresh] and Expanded Food Nutrition Education Program [EFNEP], two federally funded nutrition education programs that provide free nutrition workshops to low-income families, have joined together to practice the lessons they teach to their participants in San Joaquin County, including exercising for at least 30 minutes a day. Using home-brought exercise videos like T-25, The Firm, Hip Hop Abs and others, the nutrition staff have been sweating to the beat. Prior to the videos, the nutrition staff, along with other San Joaquin County UC Cooperative Extension employees, were doing activities like walking around the block or going to the gym together after work. Some educators even participated in weekend races or rides, such as the Color Run, Hit the Street for Hunger Run, The Electric Run, Cinderella Bike Ride and others. The exercise sessions have also improved team-building efforts. UCCE nutrition, family and consumer sciences advisor Anna Martin said after-work exercise program is a win-win situation. “I am proud that our staff has initiated activities that not only promote their own physical health, but improves their relationship as a team," Martin said. One year ago in June, the USDA unveiled the new food icon, MyPlate. 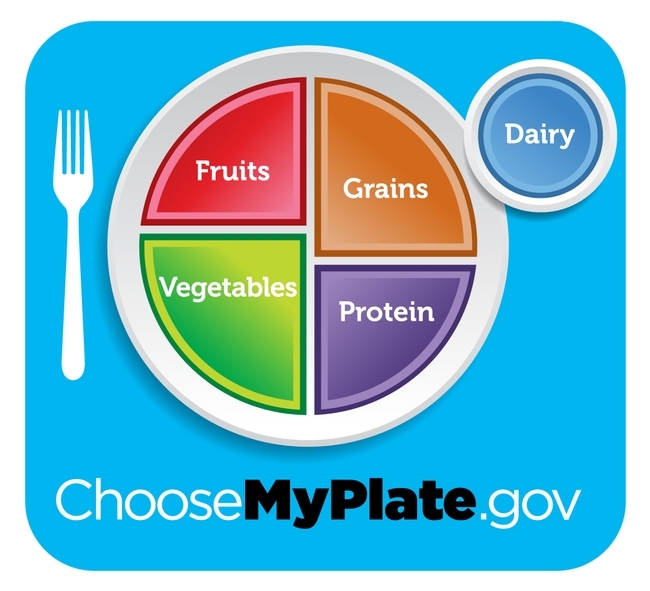 Based on the 2010 Dietary Guidelines for Americans, MyPlate was created to remind us to make healthy choices at mealtime and to visit the website to get more information. This new, improved and simplified version of MyPyramid was an exciting development for dietitians like myself. No longer would we have to explain to the public what those abstract yet colorful bands represented on MyPyramid. The plate is simple and and gets right to the point, and is a great teaching tool in my opinion. The beauty of MyPlate is that the graphic is simple, but the website is incredibly rich in information for the public and professionals alike. My favorite feature on the website is the SuperTracker, where you can get a personalized nutrition and physical activity plan. SuperTracker can become your virtual nutrition coach, urging you to meet your health goals through weekly emails.  There is also a great series of handouts called Ten Tips Nutrition Education Series. These free downloadable handouts are created in English and Spanish to help consumers get started toward a healthy diet. There are 20 different topics available now, and even more to come later. In June, my colleague and I had the pleasure of presenting MyPlate resources and activities to home economics teachers attending a conference in Garden Grove, Calif. We encouraged the teachers to connect with their local UC Cooperative Extension office where the nutrition education professionals have developed creative MyPlate activities to supplement existing nutrition education curricula. I also knew the home economics teachers would be interested in Hunger Attack. 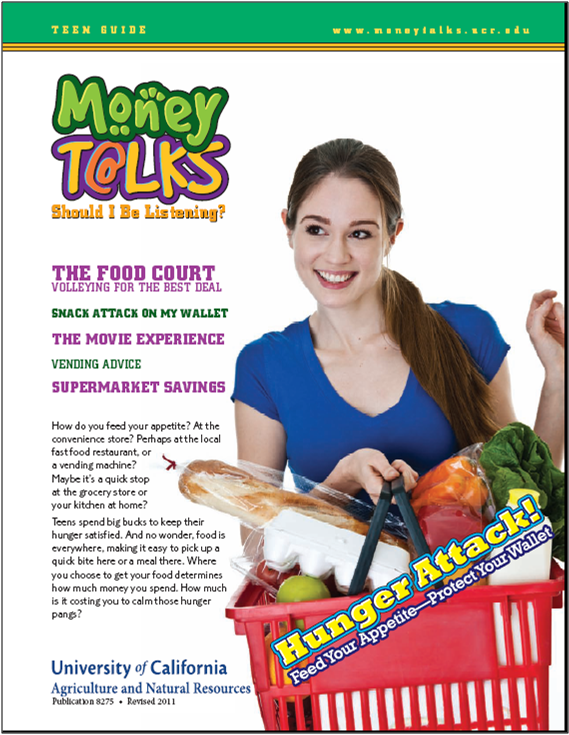 Hunger Attack is part of the MoneyTalks for Teens financial literacy education series developed by UC Cooperative Extension's Consumer Economics specialist and advisors. This resource is designed to teach teens how to make healthier choices and to save money when shopping for food, and has been updated with the MyPlate icon. This resource is made available to educators by visiting the MoneyTalks for Teens website and requesting a password, or contacting the local UC CalFresh Nutrition Education Program or Expanded Food & Nutrition Education (EFNEP) program, both operated by UC Cooperative Extension. Here's to a successful first year with MyPlate and a job-well-done to the educators and nutrition professionals who have worked so hard to extend these valuable resources to our schools and communities! 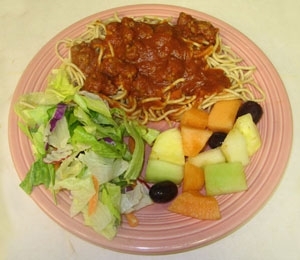 Last week (Jan. 31, 2011) the U.S. Department of Agriculture released its revised 2010 Dietary Guidelines for Americans. They are “the federal government's evidence-based nutritional guidance to promote health, reduce the risk of chronic diseases, and reduce the prevalence of overweight and obesity through improved nutrition and physical activity,” according to the press release. I scanned the press release for news that cookies have been designated an essential food group. No luck. I confess, I didn’t read the entire 95-page pdf, but surely any such rocking revelations would have been reported in the press release. Because more than one-third of children and more than two-thirds of adults in the United States are overweight or obese, the guidelines emphasize eating less and moving more. I wasn’t surprised to see among its 23 key recommendations the advice to drink more water instead of sugary drinks, eat a variety of healthy foods and reduce salt. I expected the recommendation to eat more fruits and vegetables, but now it’s more explicit. Chapter 6 of the Dietary Guidelines acknowledges that our environment – composed of school, workplace, social groups, culture and so on – influences our food and exercise choices. However, our communities don’t excuse our behavior because ultimately we make our own choices, it essentially says. We may have more access to healthy foods and opportunities to engage in physical activity than we realize. Connie Schneider, EFNEP Council chair, sees EFNEP as a vehicle to help families navigate their complicated food environments. 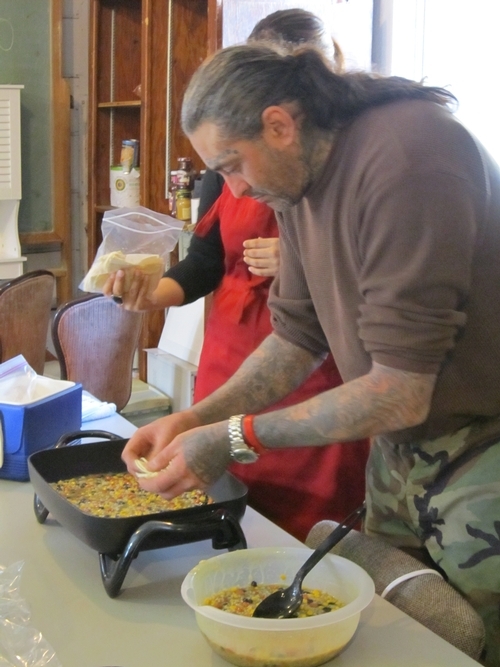 “Our educators facilitate group discussions to resolve food issues from shopping on a budget to getting their children to eat healthier foods,” said Schneider, who is also a UC Cooperative Extension nutrition advisor. Sometimes a new way of preparing a familiar vegetable encourages me to eat more veggies. The EFNEP website spotlights a Fresh Pick of the Month, such as cauliflower. The site gives the nutritional benefits of cauliflower, serving tips and recommendations for handling and storing the vegetable. It also provides a recipe for cauliflower soup. The nutrition educators also publish monthly newsletters, in English and Spanish, featuring a recipe and healthful suggestions, such as walking to the restaurant and sharing entrees when you go out to eat. Although the nutrition program is designed to assist families and children whose resources are limited, we can all use the suggestions to improve our health and save some money.